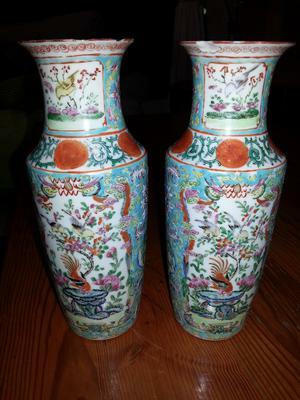 Anything interesting about these vases. I only know they have been in my mothers family for at least 3 generations so must be at least 80 years old (or there abouts). They have no marks. Curious as to age? Comments for Two chinese(?) vases? A clear bottom and foot rim picture and closeups from a few parts of the glaze would be needed. Pictures should be taken in daylight, perhaps near a window, to allow for natural colors.